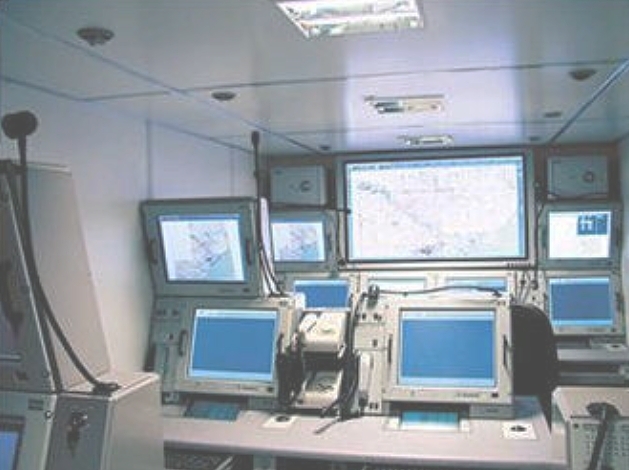 A topic which receives far too little attention in the air power debate is that of command posts, especially mobile command posts. 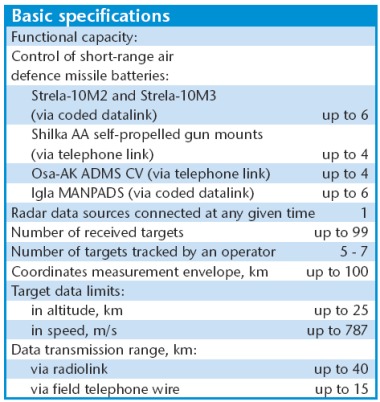 These often less than conspicuous components of air defence systems and missile batteries account for the "Integrated" in any Integrated Air Defence System. 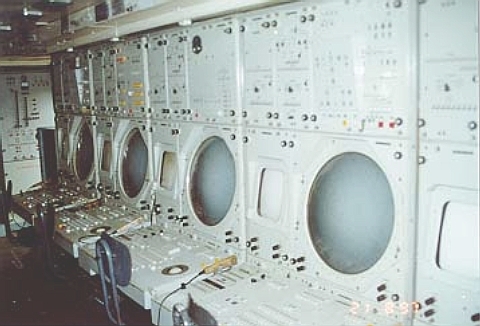 The Soviets had a number of designs which have since evolved heavily, especially with the infusion of COTS digital computer technology. Contemporary production designs make full use of large LCD panel display technology and digital processing. The page is primarily a compilation of Russian and ByeloRussian manufacturer's data and imagery. 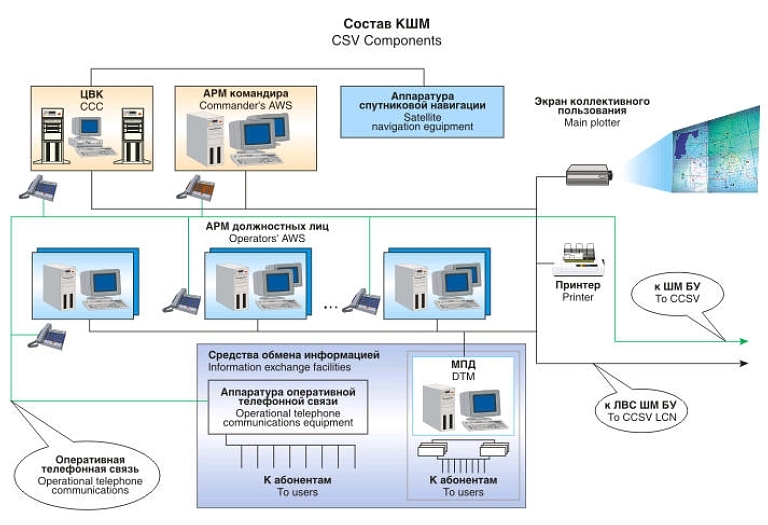 Images RuMoD, Almaz, Agat, State Military Industrial Committee of the Republic of Belarus, Other. - drills of crews of the AF/AD central command post, as well as subordinate command and control posts, and the assessment of their performance. - redeployment routes for subordinate units. The Panorama TsS/TsM is a modern software based design which makes extensive use of COTS technology, especially modern flat panel LCD displays. This results in lower weight, better reliability and higher image quality than legacy CRT display designs. 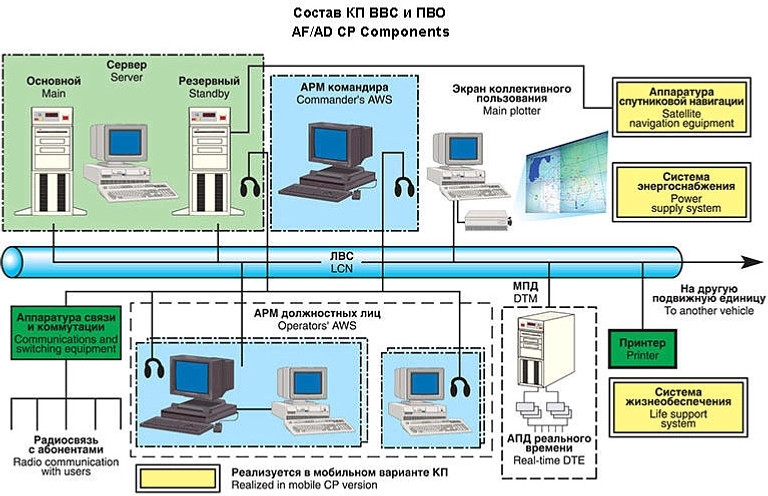 Reception, processing and storage of information about enemy forces and its transmission to subordinate command and control posts as necessary. Reception of information about the status and actions of own forces (subordinate and interacting). Collection of information about combat readiness of subordinate units and its transmission to a higher command post. 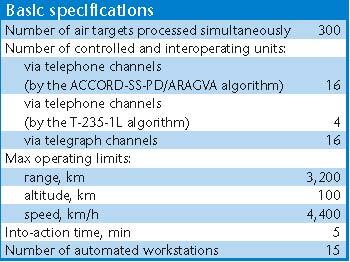 Collection and generation of information about common air situation and its transmission to subordinate units. Reception of combat orders and instructions from a higher command post. Generation of combat orders and instructions to subordinate units. 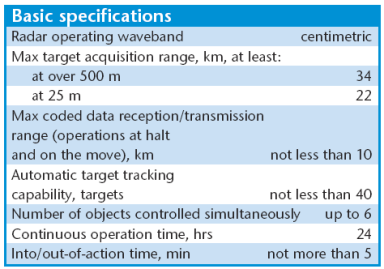 Distribution and designation of targets for subordinate units. 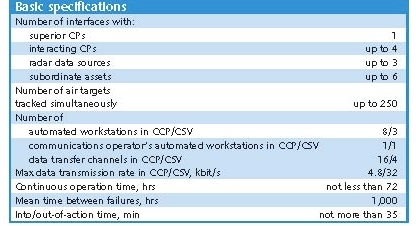 Transmission of control commands to subordinate units and reception of reports. Evaluation of efficiency of combat actions of subordinate forces. Logging and documenting of combat action. Independent and integrated training of combat crews with evaluation of their actions. 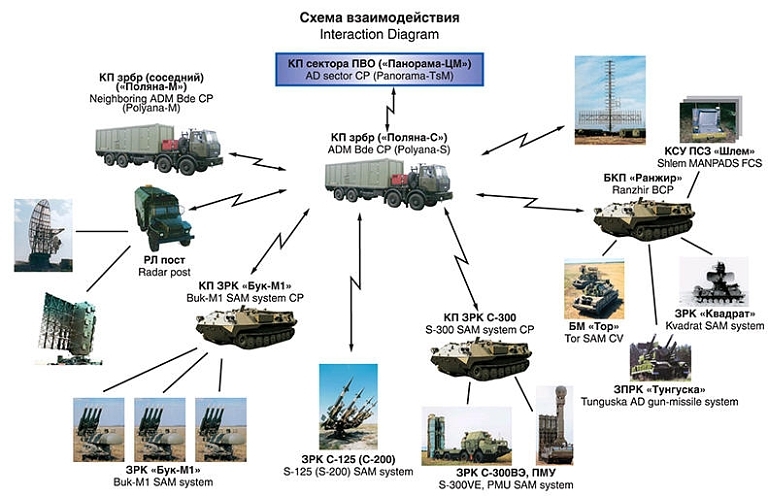 The 9S52M1 Polyana-D4M1 air defence brigade (mixed grouping) automated command and control system is designed to provide automated control of separate air defence missile systems, and their combinations, making up air defence grouping, with the S-300, Buk, Tor AD missile systems and Tunguska gun-missile systems, via relevant command and control posts. automated data exchange with superior and weather conditions at an ambient temperature interacting elements by employing data of -40°C to +50°C, average air humidity of transmission and ciphering equipment. 98%, and reduced pressure of up to 60 kilopascals (450 mm Hg). 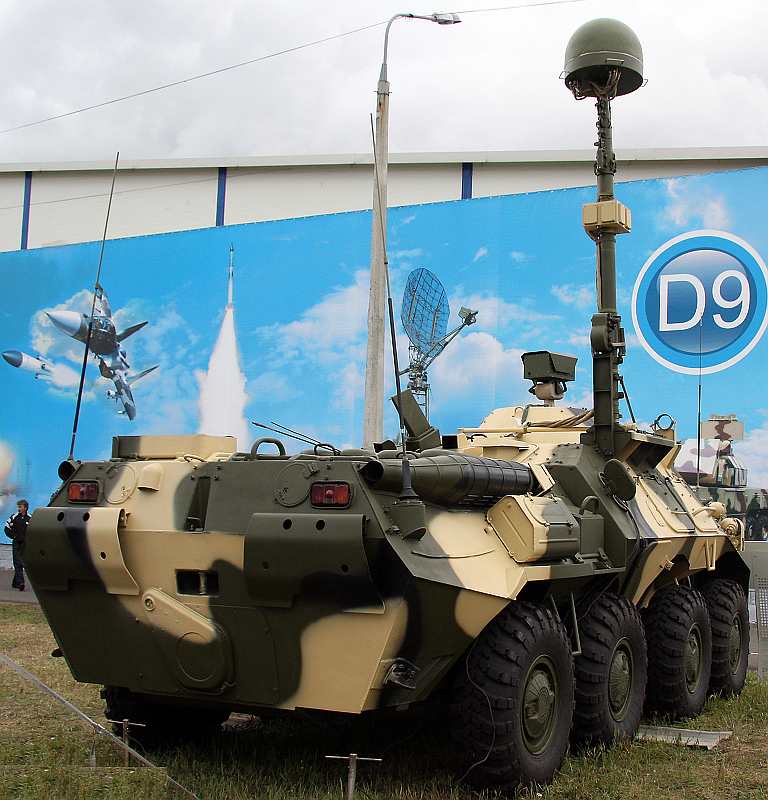 Polyana-D4M1 can be deployed in various environments. 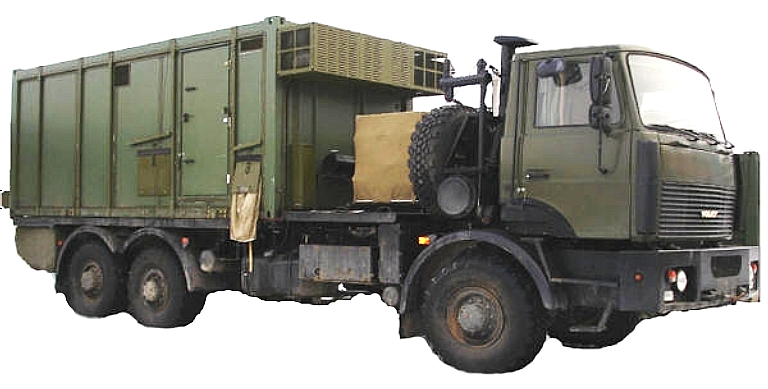 The 5S99 Senezh series of mobile command posts were developed during the latter Cold War to support V-PVO S-75/SA-2 Guideline, S-125/SA3 Goa, S-200V/D/SA-5 Gammon, S-300P/SA-10 Grumble and PVO-SV S-300V batteries, and V-PVO and FA VVS interceptors such as the Su-27 and MiG-29. The system was developed by OKB Peleng and built by GPO Vector. 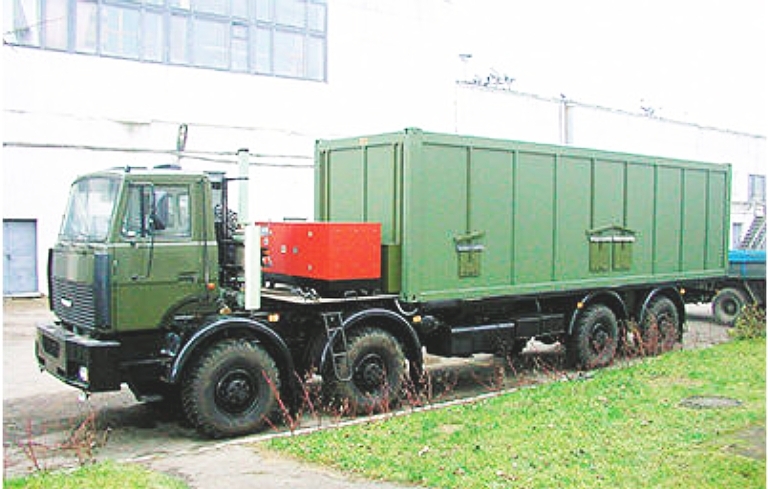 The current production 34L6 Senezh M1E is a heavily upgraded design, utilising the existing semi-trailer configuration, but replacing the KrAZ tow tractor with a contemporary KAMAZ tractor. 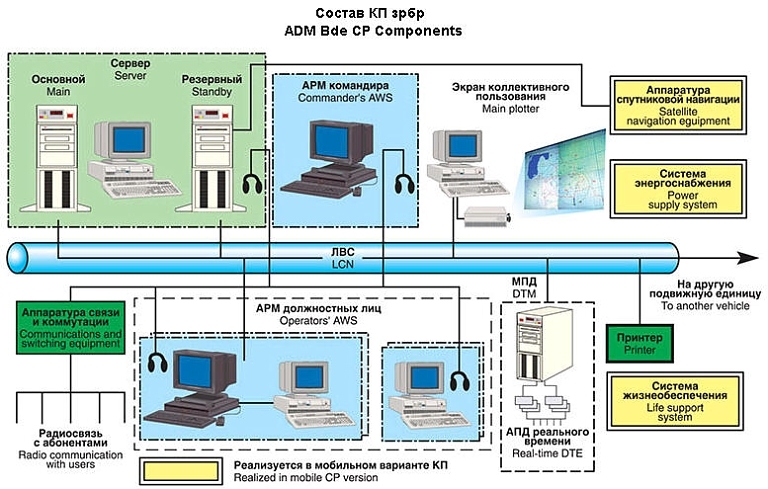 The system is capable of accepting data feeds from most Russian radar types, and the A-50 AWACS system. 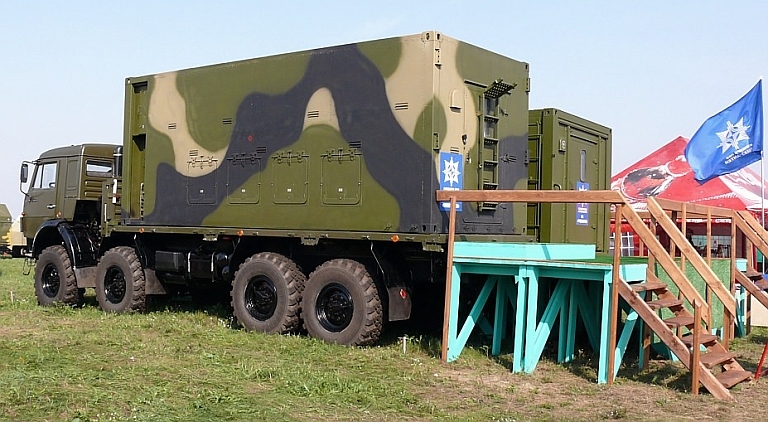 The latest configuration of the Senezh M1E uses a new technology tow tractor (Said Aminov - Vestnik PVO). Возможность получения радиолокационной информации от всех видов радиолокационных средств и АСУ ПВО. 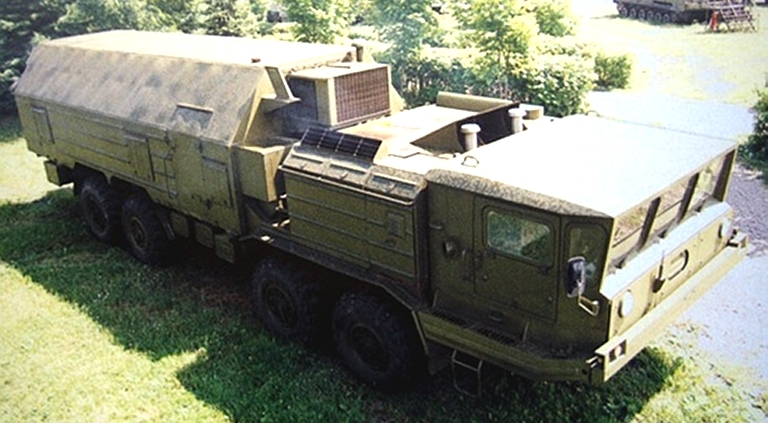 Manufactured by Proton, the Baikal and Baikal-1 series of command posts were developed during the late Cold War to provide a fully mobile capability to manage multiple air defence batteries and systems in a complex environment. Supported systems include V-PVO S-75/SA-2 Guideline, S-125/SA3 Goa, S-200V/D/SA-5 Gammon, S-300PS/PM/SA-10A/B Grumble, S-300PMU/PMU1/PMU2/SA-20 Gargoyle and PVO-SV S-300V missile batteries. The system comprises a self contained 49L6 modular C3 system carried by a MAZ-7910 series 8 x 8 vehicle for high offroad mobility. A 5S15 turbine electrical generator system is integrated, as well as an FL-94 telescoping communications mast to increase the footprint over which the system can network with missile batteries. 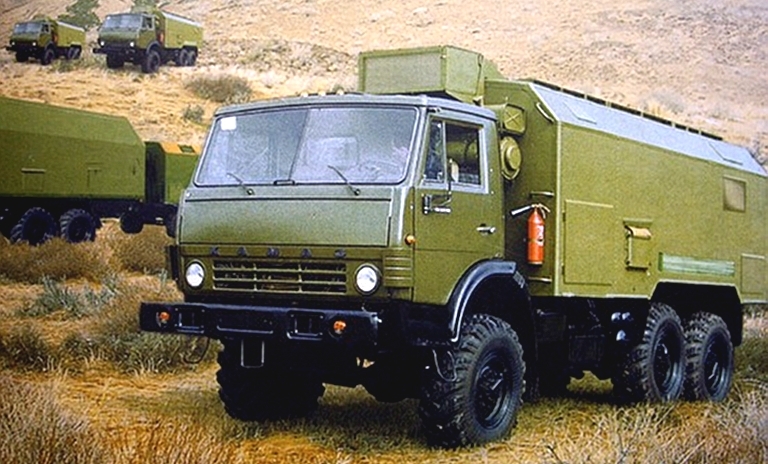 A option is an additional ZiL-131N truck fitted with an FL-95 elevating radio mast to improve networking range. Additional electrical power can by provided using a pair of towed 5I57A electrical generators, or the mains grid can be used with a 82Kh6 power adaptor. 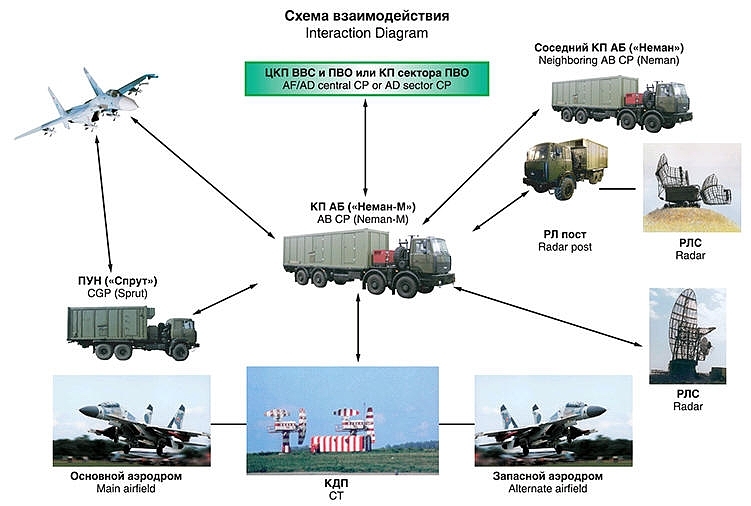 Data sources include most Russian acquisition radars and the A-50 AWACS. Время приведения в боевую готовность, мин. Time to bring in combat readiness, min. 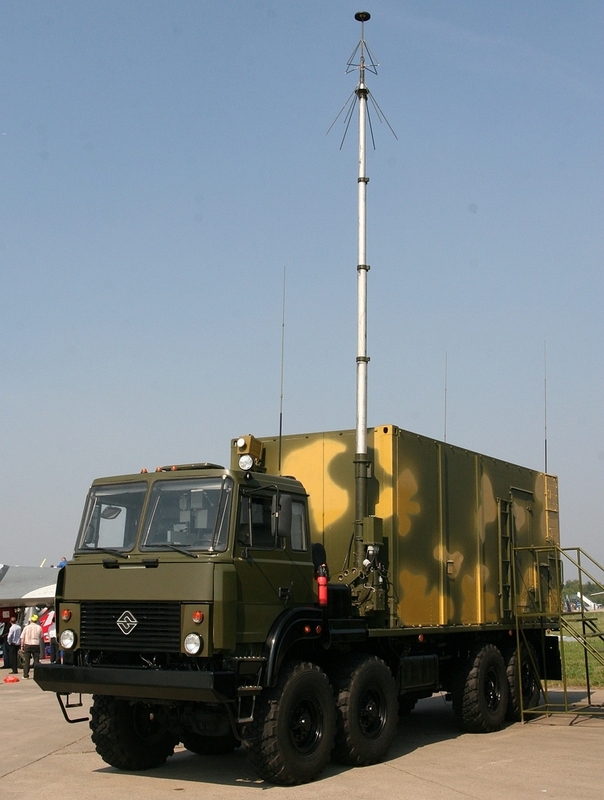 Universal-1E Air Defence C3I System at MAKS2007 (Said Aminov, Vestnik PVO). The Universal-E is a recently developed C3I system, intended for air defence applications. The Universal-1E C3I system is designed to provide automated control of combat operations of air defence, interceptor fighter, electronic warfare and electronic intelligence units repelling air attacks and performing alert duty. current and summary reports of combat work and actions conducted by subordinate forces and assets in the AD zone. 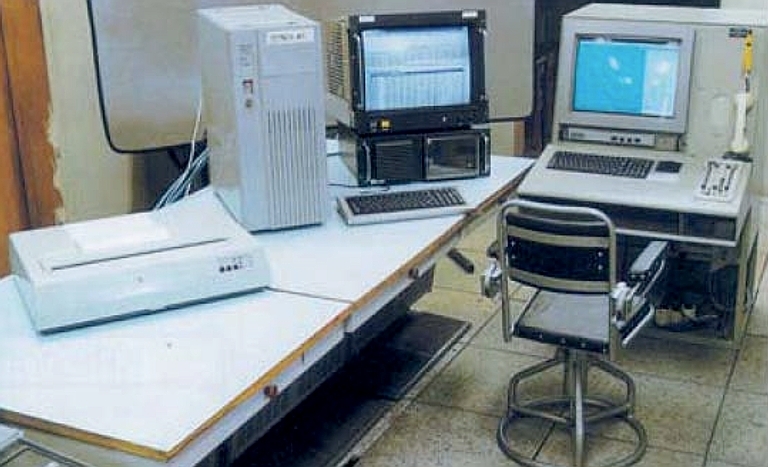 The Universal-1E C3I system comprises a central computer system, data presentation system, data transfer equipment, summary report system, recording computer, and a coded data recording equipment. The most common variant of the Ranzhir series of mobile command posts is carried on a tracked chassis derived from the MTLBu series. 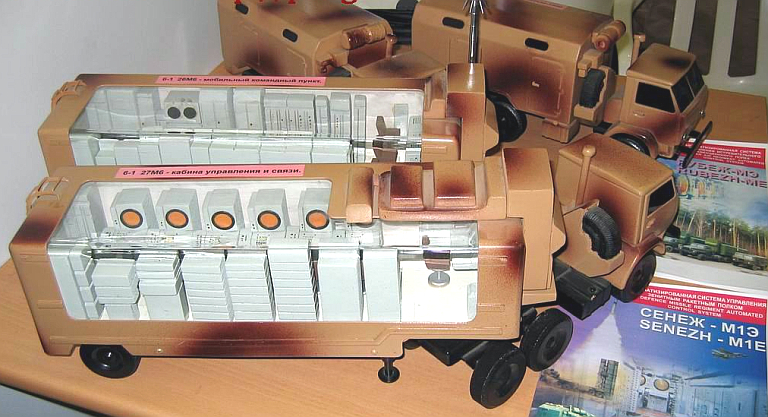 The Ranzhir series of mobile command posts was originally developed for the PVO-SV to provide a tracked and hardened ADCP for batteries of point defence weapons, such as SPAAGs and SAM systems. 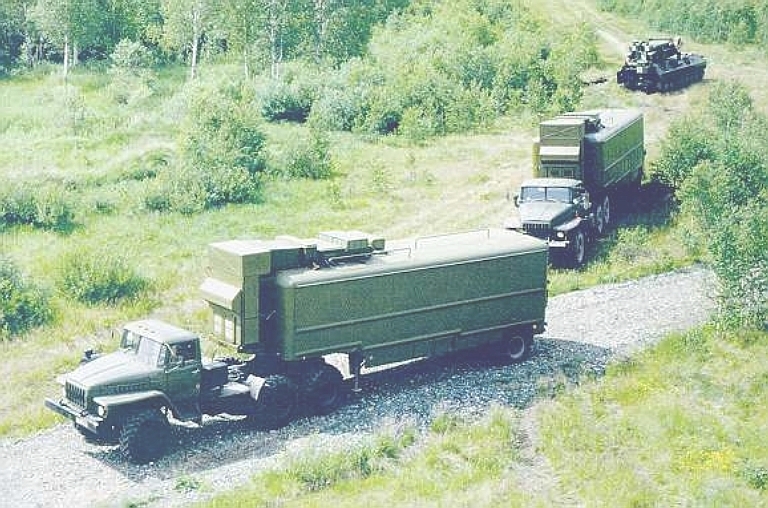 Early variants were deployed to provide battery C3 for the SA-15, SA-17, SA-19 systems. 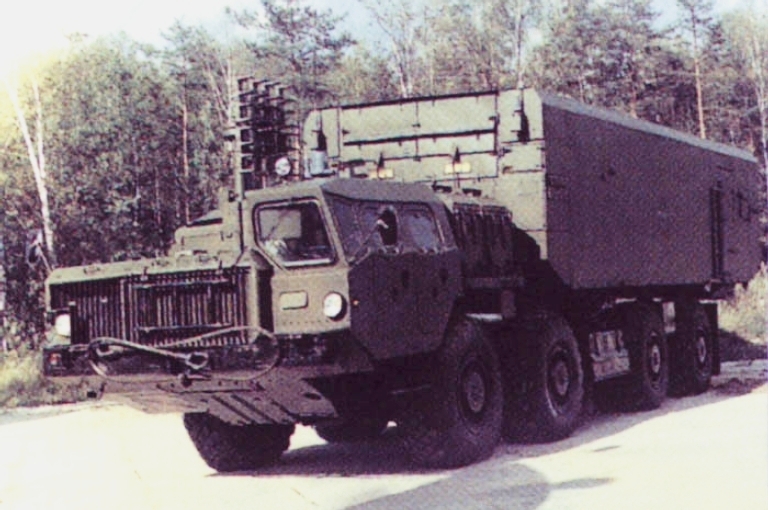 More recent variants are used with the SA-13, replacing legacy ADCPs, and the new wheeled SA-15 and SA-22, in a wheeled configuration. A single Ranzhir usually supports 4 to 6 TELARs, SPAAGMs or SPAAGs. The Ranzhir E/M is also available in a lower cost truck variant, intended for applications where high road mobility is important. 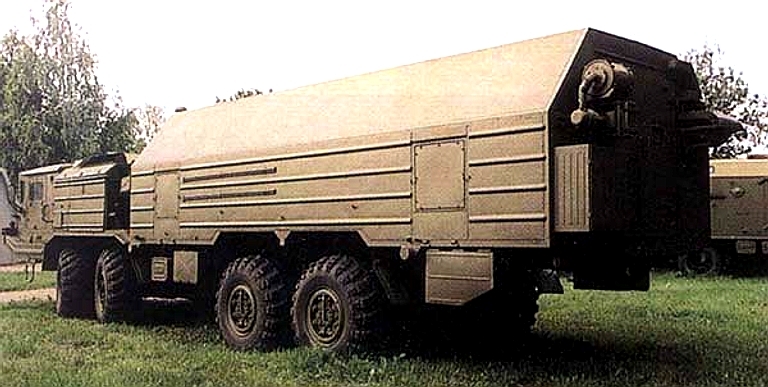 For instance a wheeled Tor M2E or Pantsir S1 battery would used the wheeled variant to match the high road speed of the TELARs. 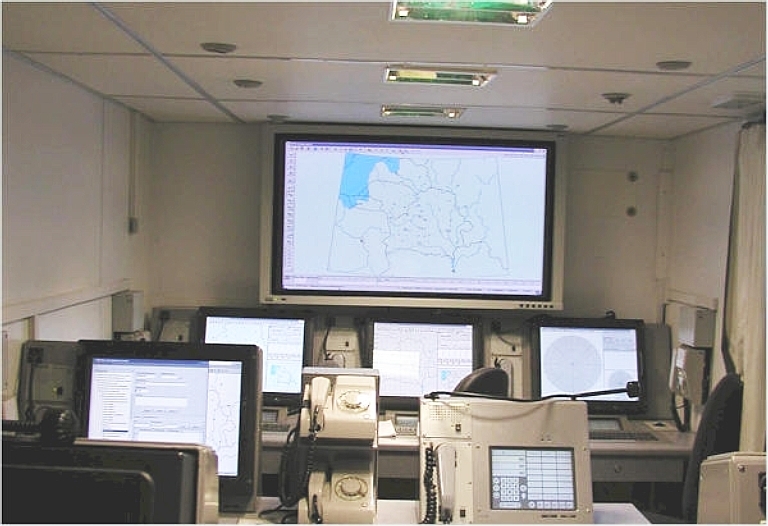 The latest configuration of the road mobile Ranzhir M/E series makes full use of COTS computing technology for operator consoles. 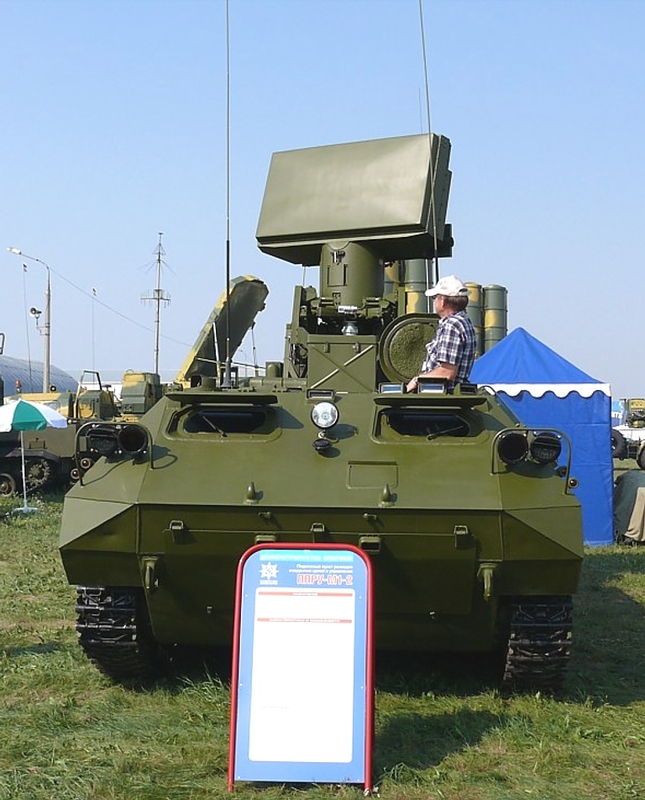 Late model PU-12-M7 / BTR-80 on display at MAKS 2009 with deployed antenna mast (© 2009 Vitaliy V. Kuzmin). 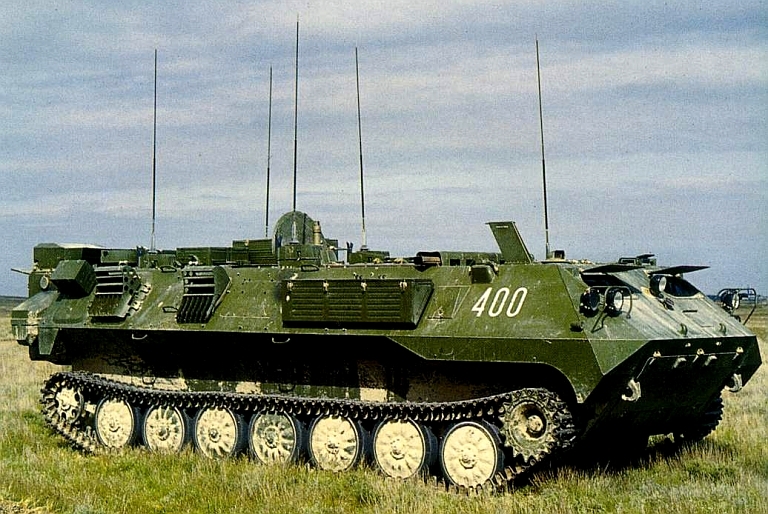 The Cold War era PU12 series of battery command posts were developed to support a range of point defence weapons, especially the SA-8 Gecko, SA-13 Gopher and ZSU-23-4P SPAAG. While a legacy design, it remains in production. 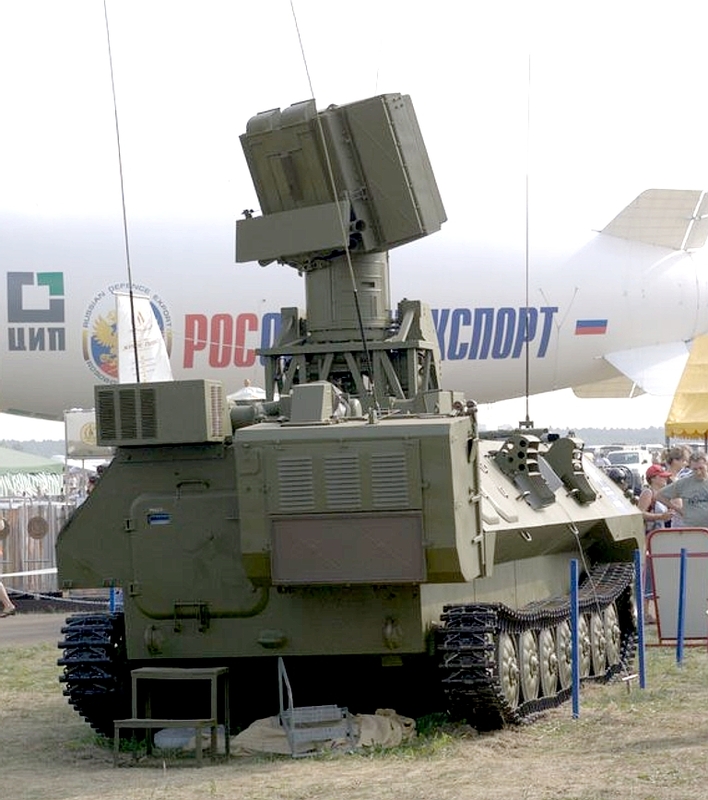 The improved M7 variant has the capability to control an SA-19 Grison battery. 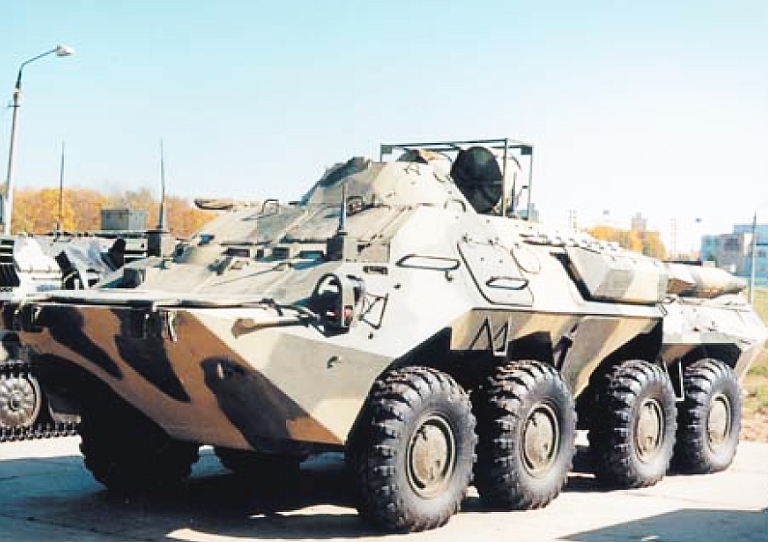 The system is installed in a BTR-80 chassis. 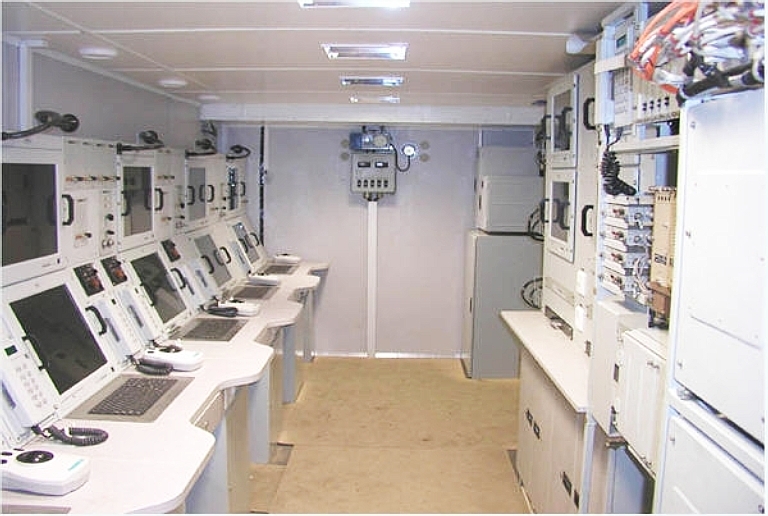 The PU-12M6 mobile control post is designed to automate combat control of weapons employment by AD units on the move and at halt under air attack. 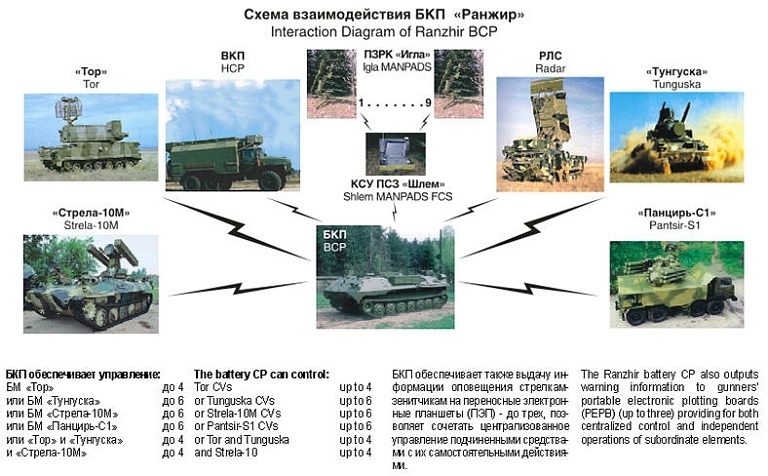 It is a battery CP intended to operate as part of special purpose automated control systems. 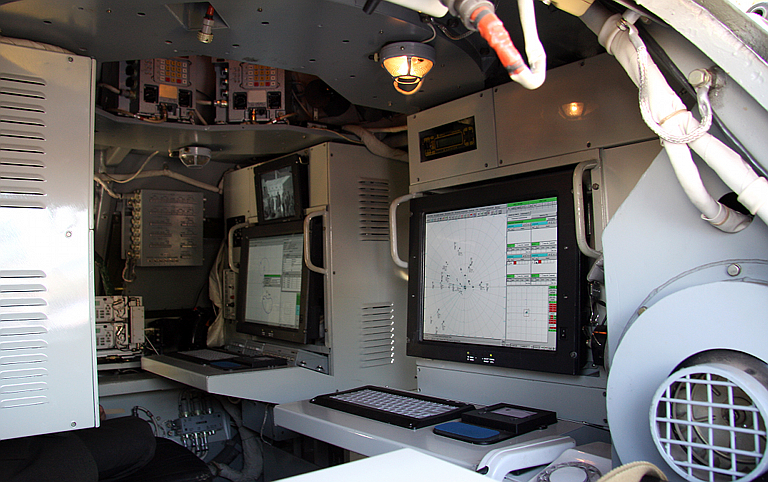 The PU-12M7 mobile control post is designed to automate combat control of weapons employment by AD units on the move and at halt under air attack. 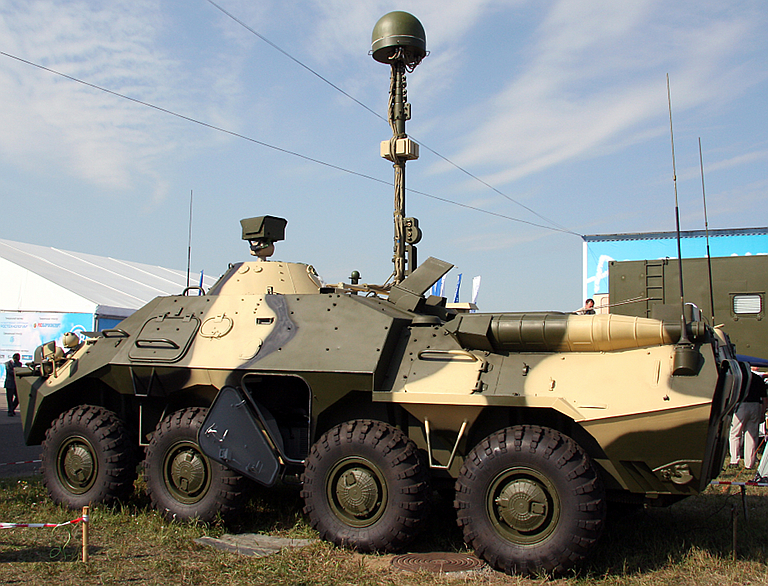 Above, below, PU-12-M7 / BTR-80 on display at MAKS 2009 with deployed antenna mast (© 2009 Vitaliy V. Kuzmin). 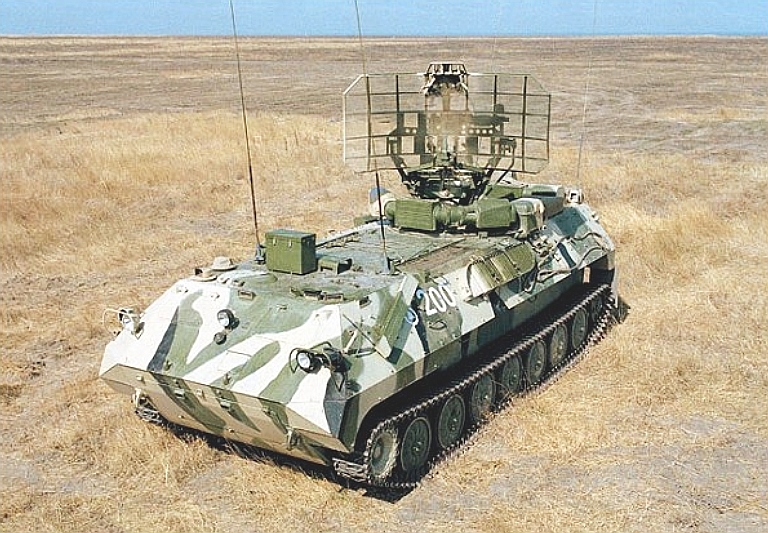 The most recent variant of the PPRU series is the PPRU-1M-2 which is digital, and includes the new design solid state digital VNIIRT 9S80M1-2 radar replacing the legacy Dog Ear variants (Said Aminov, Vestnik PVO). 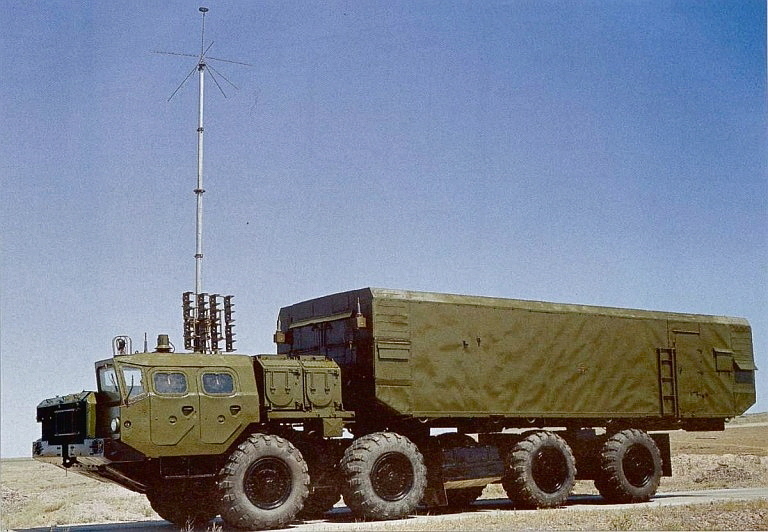 The legacy PPRU M/M1 series of command posts were used primarily to support the 9K35/SA-13 Gopher and 2K22/SA-19 Grison point defence SAM system. The design remains in production. Early variants used the X-band 9S80/9S80M/M1 Ovod / Dog Ear as a battery acquisition radar. 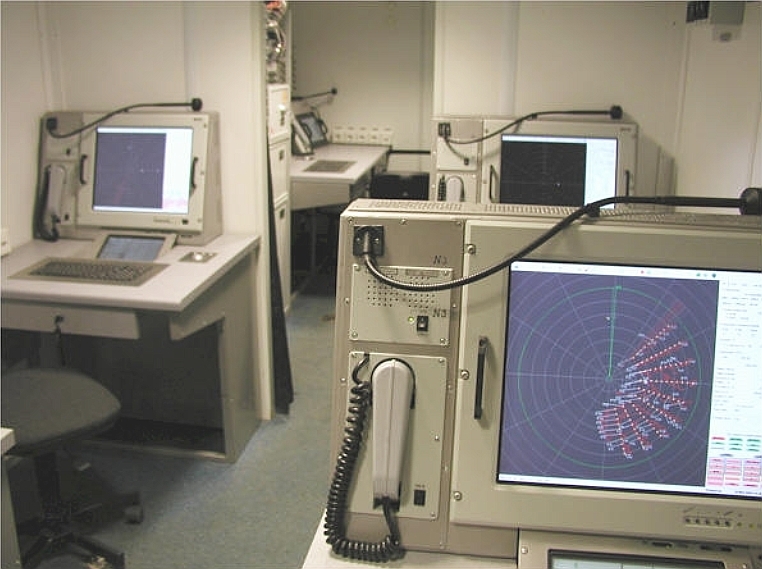 The most recent variant, displayed at MAKS 2007, includes the new design digital solid state VNIIRT 9S80M1-2 X-band radar, replacing the analogue Dog Ear. The MTLBu chassis is employed. The PPRU-M1 air target reconnaissance and control post is designed to control, both on the move and at halt, combat actions and fire delivery of air defence units armed with close/short-range antiaircraft artillery and missile systems. The PPRU-M1 CP provides full control of combat operations of any AD unit irrespective of its armaments and table of organisation. 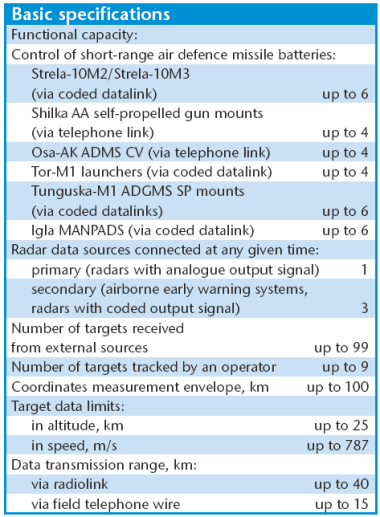 It exercises combat control of units armed with manportable surface-to-air missile systems via coded datalinks provided that MANPADS operators employ the 1L15/1L110 hand-held electronic data displays. The PPRU-M1 CP can be operated in various climates at ambient temperatures from -20°C to +50°C, relative air humidity of 98%, and wind speed of 30 m/s. PPRU-1M with 9S80M Dog Ear. 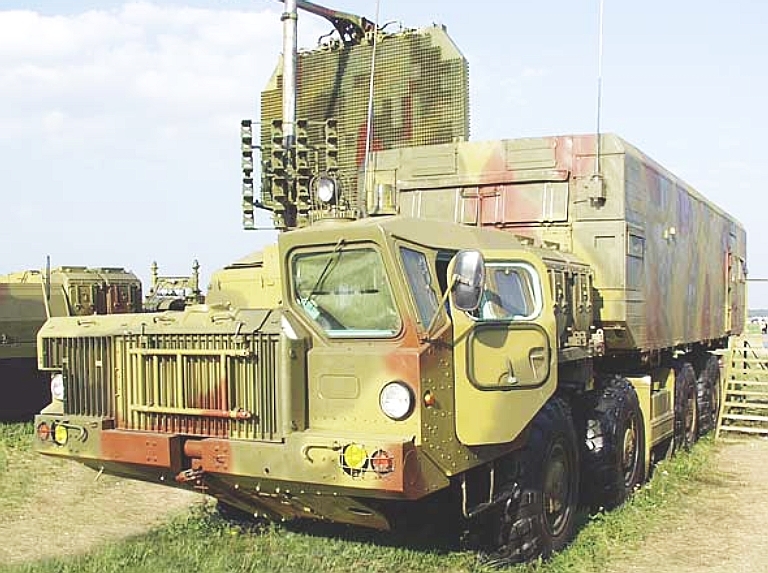 An early model 54K6E2 command post used with the S-300PMU2 Favorit / SA-20B system. 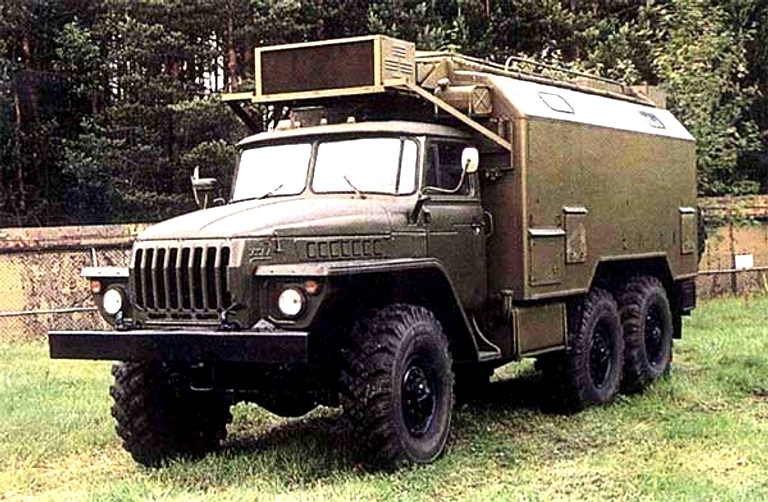 The 54K6 family of mobile battery command posts first appeared during the 1980s as part of the high mobility S-300PS / SA-10B Grumble B SAM system. 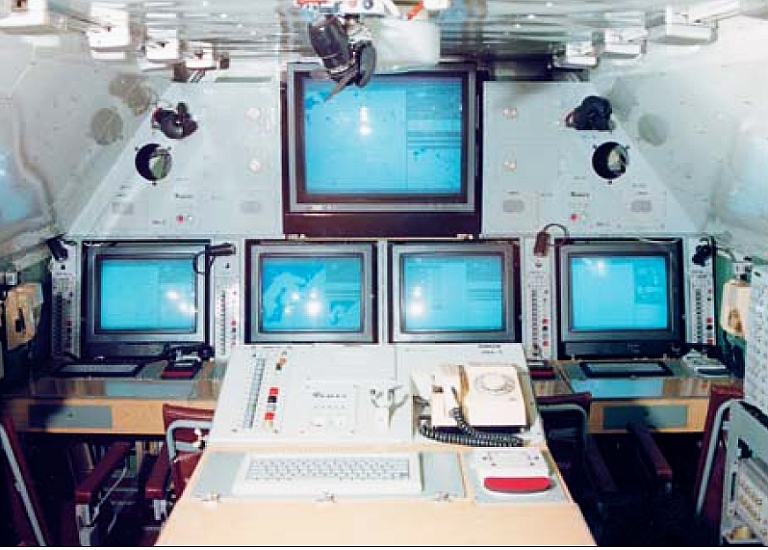 The design combined a command post cabin with a MAZ-7910 chassis, and included a telescoping mast for the radio datalink which networked all of the battery elements. The design progressively evolved as the S-300P family of missiles evolved. 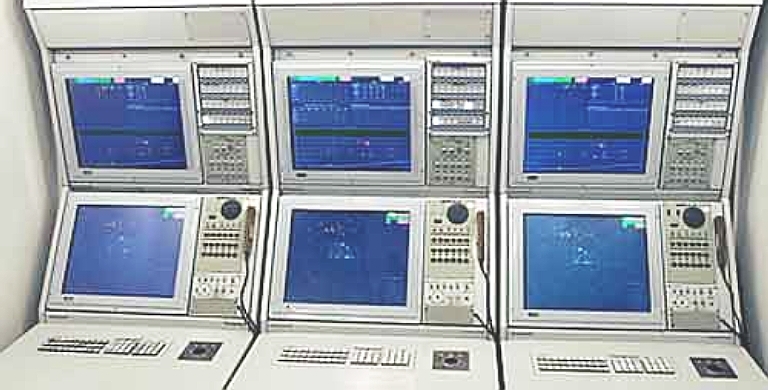 The final variants of this system provided significant integration capabilities, with the ability to network the battery 30N6E2 engagement radars, and some legacy SAM engagement radars. The 83M6E2 designation is reserved for a paired 64N6E2 Big Bird acquisition radar and a 54K6E2 command post. 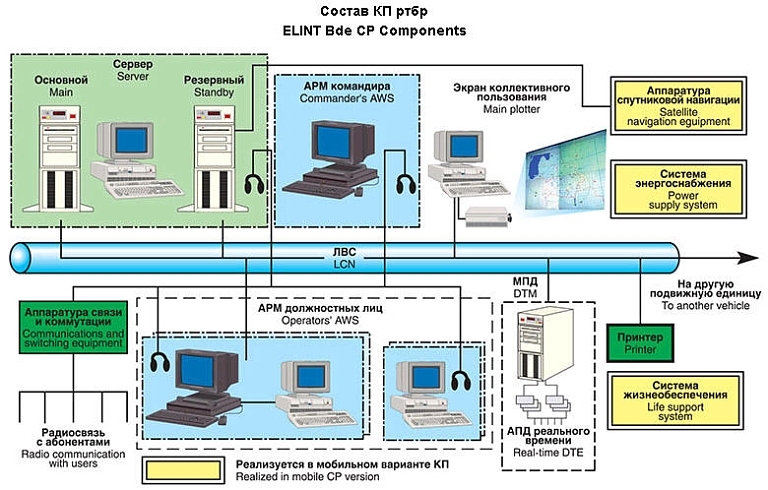 A typical operational architecture will see the 54K6E2 networked with a Polyana TsM sector command post, to provide bidirectional transfer of target data. 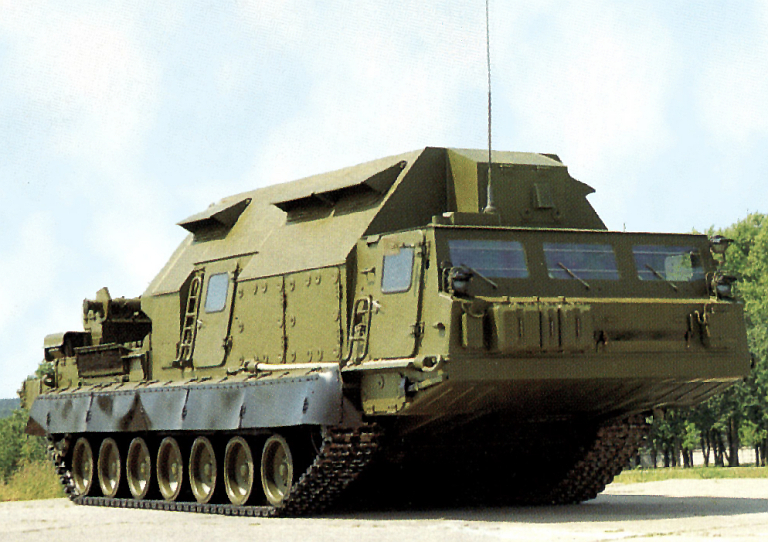 The 9S457 family of mobile battery command posts was specifically developed for the PVO-SV S-300V SAM system. A modernised variant of this design is the 9S457M used with the S-300VM/Antey 2500. The design shares the tracked chassis with other battery elements, and uses a telescoping mast to maximise RF datalink coverage footprint. The vehicle weight 39 tonnes and carries a crew of seven. 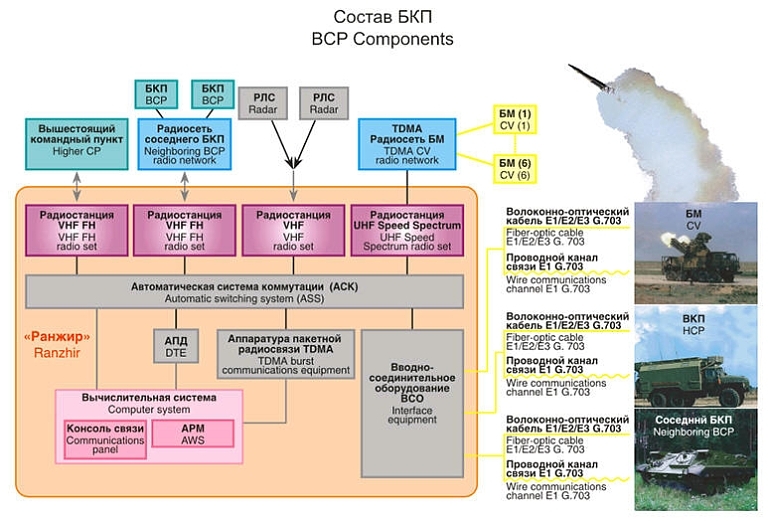 The composition of a typical S-300VM battery includes a 9S15M2 Bill Board acquisition radar, a 9S19M High Screen engagement radar, a 9S457M command posts, four 9S32M Grill Pan engagement radars, twenty four 9A83M and 9A82 TELARs, with a ready load of 48 x 9M82M SAMs, and 96 x 9M83M SAMs. 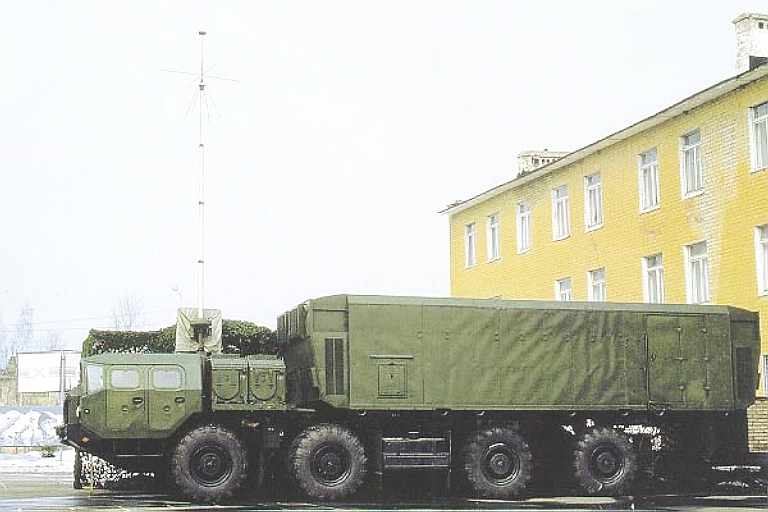 An S-400 55K6 Command Post with deployed antenna mast. 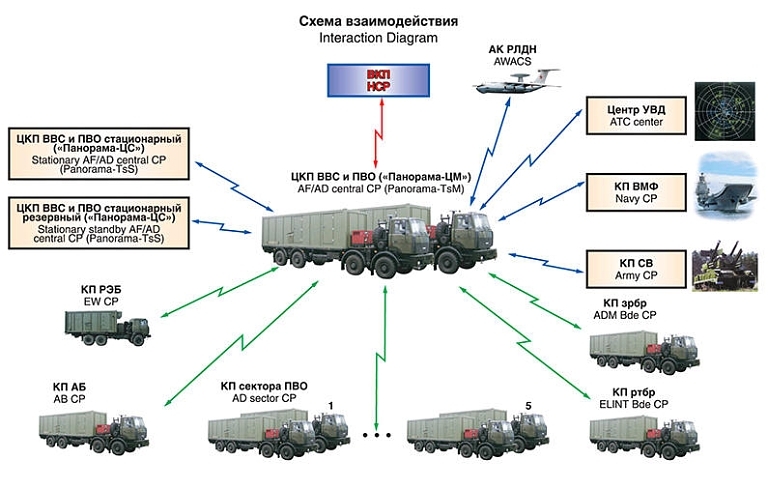 This design is visually indistinguishable from the S-300PMU2 54K6E2 Command Post (image © Miroslav Gyűrösi). 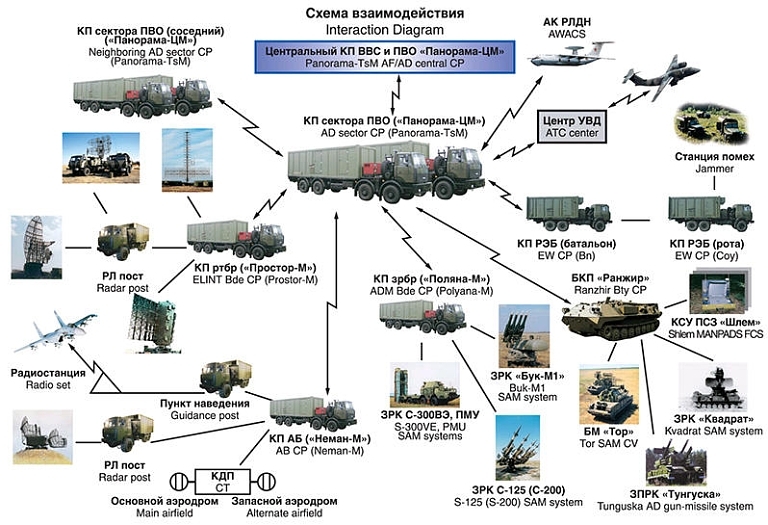 The 54K6E2 and 55K6/55K6E are the respective Command Posts for the S-300PMU2 and S-400 SAM systems. 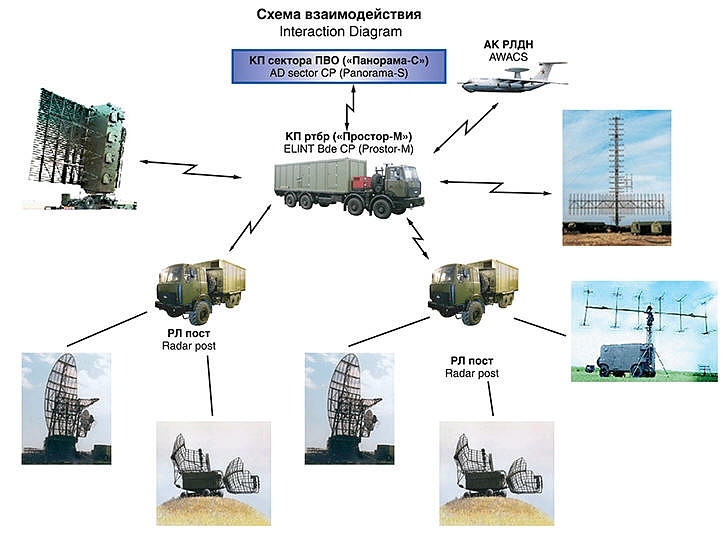 While both share common vehicles, containers, consoles, computer hardware and antennas, the 55K6 has more extensive capabilities to integrate with other IADS components, and specific interfaces and software for S-400 Triumf radar systems. The new digital CP design fits into one half the volume and mass of the legacy 54K6E CP, with 3 to 4 times lower power consumption. Composition of the 55K6 C3 suite has not been disclosed. 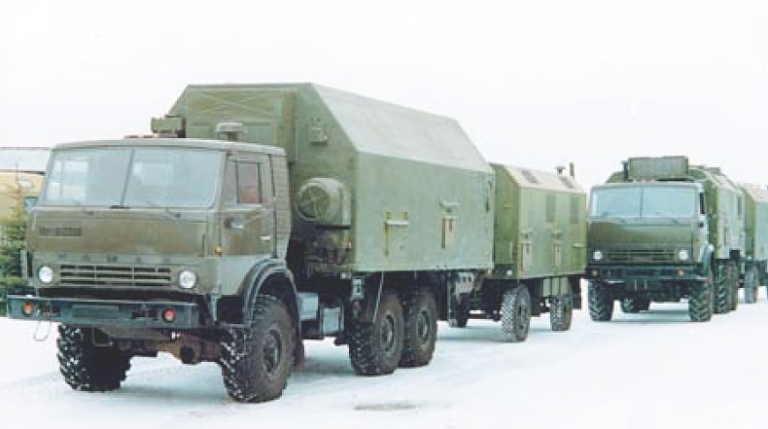 55K6E CP carried by an 8 x 8 Ural 532301 - operator consoles in van (Almaz-Antey).